Luxuriate in warm, thoughtful hospitality in the heart of the city. Welcome to Grand Park City Hall. Located in a prime spot in Singapore’s Civic District and within the Central Business District (CBD), Grand Park City Hall is a stone's throw from major shopping malls such as Raffles City and Capitol Piazza and endless dining options. Suntec City and the Marina Bay entertainment and business district are minutes away by car. We look forward to welcome you with our warm and loving hospitality. Book your stay directly with us via your mobile to enjoy additional 10% off our Best Available Rates! The New Grand Park City Hall is a familiar brand that assures, promises, rewards and delivers every time. You are invited to discover Singapore’s authentic culture and traditions brought to life through the rich narratives and intriguing stories. Coupled with elegance, finesse and modern technology, the New Grand Park City Hall is a classic that never gets old. The ultimate family getaway - experience both time alone and time with your kids. These parents' and children connecting guest rooms combine distinctive design elements and detailing with practicality. We have made business travel easy with the essentials that you need. Book a minimum of 3 nights and enjoy*: 5% off Best Flexible Rates Choice of buffet breakfast or gourmet breakfast takeaway Complimentary Wi-Fi 20% off Laundry services Book your stay directly with us and be rewarded with 7 exclusive benefits. 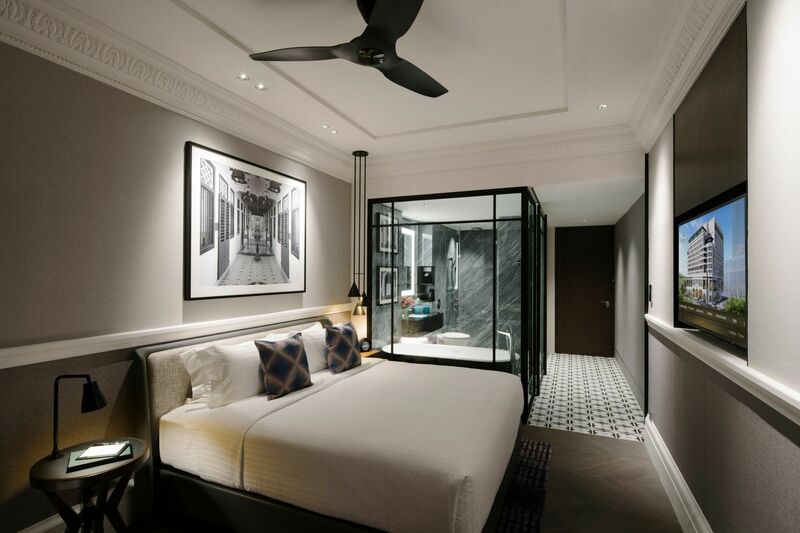 Room interiors take a modern local twist that showcase Peranakan-patterned floor tiles paired with colonial-inspired details infused throughout. Every room is designed to be intuitive and boasts technological conveniences that include touch sensitive lamps, charging ports for smartphone devices and energy efficient ceiling fans. Controlling lights and in-room climate cooling is made easy with mobile app and in-room touchpad control. Offering commanding views over the Lion City’s iconic skyline, the guest rooms and suites of this luxury lifestyle hotel are a place for respite, away from the city's hustle and bustle. We’ve put together a city guide inclusive of what to see, do and eat around the little red dot during the Singapore Art Week.